2013 marked a year of major changes for us here at GayChurch.org. Our website was totally rebuilt with modern technology, and we completed a massive sweep-through all of the church listings to confirm that the churches listed were still active. Because of this massive clean-up, while hundreds of churches were added this year, many others were removed. Thus the net year-to-year net gain of 340 churches was strong but not indicative of the activity that transpired over the course of the year. We ended 2013 with 7,457 churches in the directory covering 47 countries around the world. Online form for churches to request their addition, modifications, etc. Before bringing over the directory, Don did a massive sweep-through all of the church listings, links etc. to confirm – to the best of our ability – that the churches listed were still active and the links valid. Needless to say it’s a major undertaking to keep up with the churches, especially when some close their doors without notification. Because of this massive clean-up, while hundreds of churches were added this year, many others were removed. Thus the net year-to-year net gain of churches was strong but not indicative of the activity that transpired over the course of the year. I believe the gay marriage initiatives throughout this country and the world is a key indicator that major progress has taken place. Religious beliefs, unfortunately, are one of the major reasons why prejudice has been allowed to continue against the gay and lesbian community for so long. Indeed, it was religious dogma that gave ‘validity’ to allowing prejudice to exist in the first place. In the same manner, I believe that opening church doors, hearts, and minds will in turn, be the vehicle that helps break down these same walls. I am constantly reminded in my heart that this movement is as much to heal the Body of Christ herself (i.e. the church as a whole) – as it is for us in the gay and lesbian community. 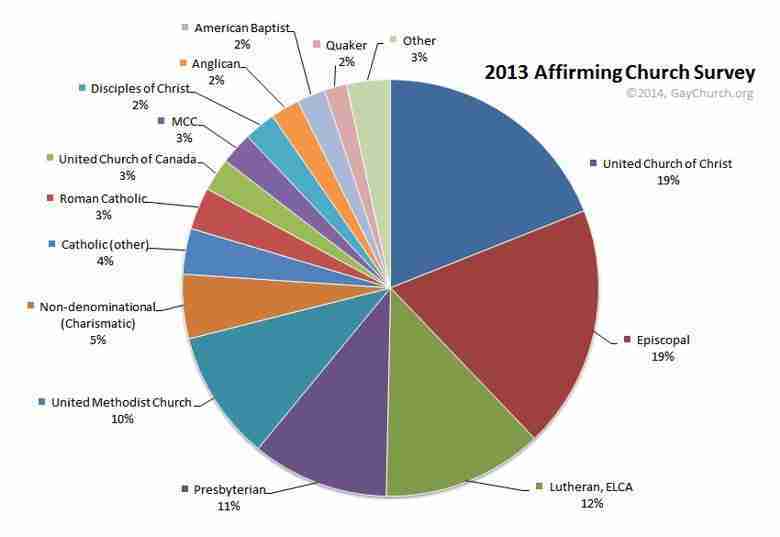 The five denominations of United Church of Christ, Episcopal, Lutheran ELCA, Presbyterian, and United Methodist account for 4,623 of the churches listed, which is close to 70% of the directory. 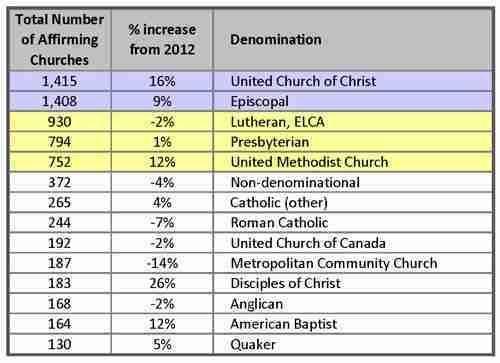 The only change from 2012 being that the United Church of Christ has moved slightly ahead of the Episcopal churches to be the most prolific gay affirming denomination. I see this trend continuing through 2014 and beyond. While the majority of the affirming churches are encompassed within the five major denominations it’s clear this revival isn’t stopping there. To that end the revival now encompasses seventy two different denominations that span across forty six different countries. The United Church of Christ, Episcopalian, MCC and others will not be the last denominations to fully embrace the gay and lesbian community before the work of the Holy Spirit is completed. Another trend that has continued is that the affirming churches many times no longer belong to their denominations ‘welcoming’ associations and groups. A big part of this could be that we’re beginning to see entire denominations becoming predominately welcoming and thus, the churches don’t feel the need to belong to a group within their denomination to support their efforts. The downside for us at gaychurch.org is that we can no longer go to a particular denomination’s welcoming association/group to find these churches. We now must canvas all congregations within a particular denomination to find the affirming churches. Thankfully the directory has gotten popular enough (#1 on all of the major search engines) that many of these churches now come to us and request to be added. That has made our job a lot easier. Another trend that has continued is the number of independent Catholic churches now surpasses the number of Roman Catholic parishes that are brave enough to publically pronounce their affirming stance. The latter is hardly surprising though, given the Vatican’s ongoing negative policy toward the gay and lesbian community. Hopefully we will begin to see this stance soften under Pope Frances. For all of the good news, the charismatic denominations still remain predominately closed to gays and lesbians. For gay and lesbian members of this community, the only way they will find an affirming church is if a minister is brave enough to strike out and begin their own independent church. Thankfully there are many with this calling on their lives, and thus the “Non-denominational” churches continue to thrive in spite of having few, if any, national groups to support their efforts. These are also the hardest churches for us to find, as they have to reach out to us to be added to the directory, as there is no national group, outside of us, to give visibility to their efforts. The final trend we’ve noticed over the years is the ongoing decline of the primarily gay focused denominations and groups such as MCC, Dignity (Roman Catholic), Alliance of Christian Churches, and TEN (Charismatic). All of which were the early front runners to this movement. There are many possible reasons for this. 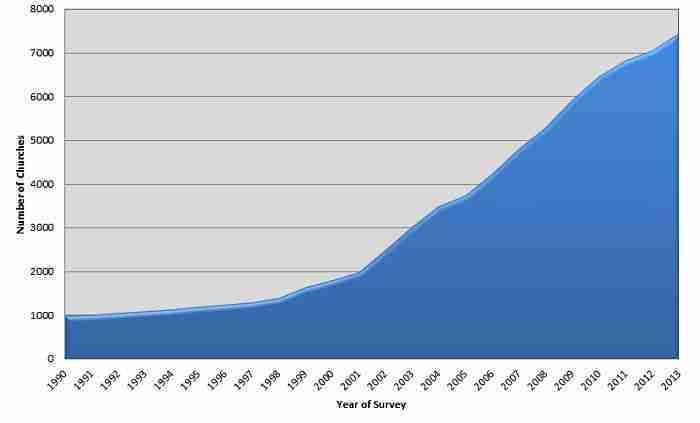 First, gays and lesbians have many more church choices now than they did twenty years ago. Second, many of the early participants in these churches have aged. With the younger generations going elsewhere, these churches are slowly declining in numbers. Finally, many favor churches that are broad in focus, and whose congregants are gay and straight alike. Only denominations that self-identify as being “Christian” are contained in the church directory. The gay affirming revival within the Christian churches continues to expand at a rapid rate. We have seen this growth reflected; not only in our church directory, but also in the tens of thousands of new visitors to the website that we get every month. Numbers aside, I believe we are seeing a continuation of a ‘grassroots’ effort which propels the leading edge of this revival: individual pastors, congregants, families, friends, and countless others who are at the heart of this movement. They are what makes it personal, gives the revival traction, and who are willing to do the heavy lifting required to open hearts, minds and eventually – church doors. In conclusion, I would like to thank Don for completely changing this ministry’s website and church directory over the past year. A Herculean effort that has made it feasible to continue with this online ministry. I would also like to thank Eric for his dedication and heart in this work. Your loving ministry has helped countless number of churches open their doors to our community. As I have said before, together we have a front row seat to a marvelous work that the Holy Spirit is unfolding right in front of our eyes. This truly will be one of the great revivals in the history of the Church before it is done. Truly, this is an exciting time to be in the Lord’s service.